Genetic mutations in PMP22 (peripheral myelin protein 22) cause a variety of peripheral neuropathies, underscoring the importance of the protein to a healthy peripheral nervous system. But the precise function of PMP22, a major component of the myelin sheath that surrounds and insulates peripheral nerve cell axons, has been unclear. 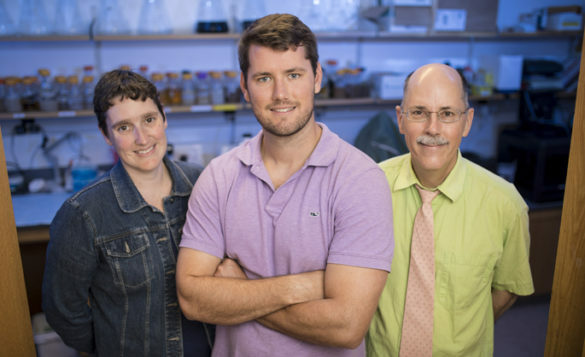 Now, Vanderbilt investigators have discovered that PMP22 alters membrane architecture, suggesting that it plays a role in generating the complex membrane structure of myelin. The findings, reported recently in Science Advances, provide a biochemical assay for PMP22 function, which could be used to identify compounds that restore activity to mutated PMP22 proteins. “This is the first time there’s been any sort of biochemical activity associated with PMP22,” said Melanie Ohi, Ph.D., associate professor of Cell and Developmental Biology. Ohi’s team collaborated with Charles Sanders, Ph.D., Aileen M. Lange and Annie Mary Lyle Professor of Cardiovascular Research, to explore PMP22’s structure. Sanders and his group had studied PMP22 to understand how genetic mutations cause peripheral neuropathies, in particular the most common inherited neuropathy, Charcot- Marie-Tooth disease type 1A. Patients with peripheral neuropathies may experience pain, tingling, numbness and progressive muscle weakness. The researchers discovered that some mutations in PMP22 reduce the protein-folding stability of the protein. Graduate students Kathleen Mittendorf, Ph.D., and Justin Marinko led efforts to use 2-D crystallography and electron microscopy to determine PMP22 structure. Although they were not successful in generating crystals, they observed “interesting membrane shapes…swirls and stacks of membranes…that looked very reminiscent of what myelin looks like,” Ohi said. In the peripheral nervous system, myelin forms when “membrane tongues” extend from Schwann cells to spirally wrap around an adjacent axon. The myelin sheath enables rapid conduction of electrical impulses, and its appropriate organization is critical for proper nerve activity. PMP22 mutations lead to demyelination and axonal loss. The investigators characterized the structure of the “myelin-like assemblies” they observed using an approach called cryoelectron tomography in collaboration with Elizabeth Wright, Ph.D., at Emory University. “We learned that the structures were not exactly like myelin, but they did have layers of flattened and wrapped vesicles,” Ohi said. Formation of the myelin-like assemblies depended on the ratio of lipids to PMP22 as well as on the extracellular loop portions of the PMP22 protein. Importantly, formation of the myelin-like assemblies was disrupted by neuropathy-causing mutations in PMP22. Collaborator Jun Li, M.D., Ph.D., professor of Neurology at Vanderbilt, has demonstrated that mice missing PMP22 have “unraveled” myelin in certain areas where other myelin proteins are not expressed. Other Vanderbilt authors of the Science Advances report include Arina Hadziselimovic, Jonathan Schlebach, Ph.D., and Cheryl Law. This research was supported by grants from the National Institutes of Health (NS058815, NS095989, NS066927, GM104540, GM114561).